Our AI Sales Assistant can qualify leads, answer questions, schedule follow-ups, and remove uninterested customers 24 hours a day, 7 days a week. Your sales and marketing AI assistant will schedule follow-up appointments when customers are too busy to connect. 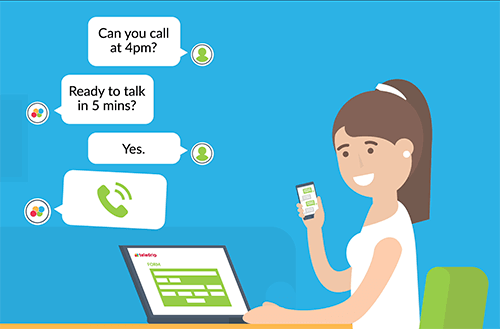 The AI will call the consumers back at their requested day and time or can even send the scheduled appointments to your sales team. Training AI is not glamorous. It’s a very tedious and time consuming task that takes a lot of time and data. Luckily your TeleDrip AI Assistant will be trained out of the box. We’ve processed millions of marketing messages to train your AI Assistant so that day one of your campaign results in conversions, schedule calls, and questions answered. 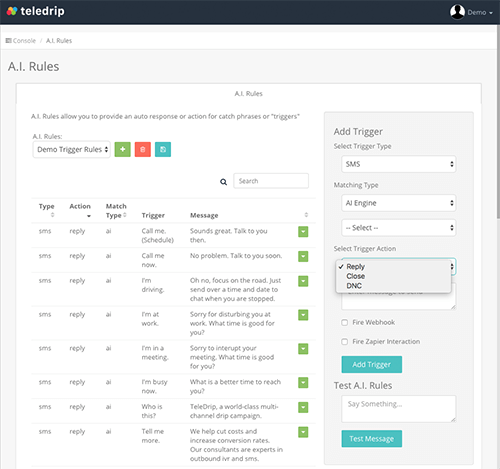 You can use our default AI Rules or setup your own custom rules or triggers through our simple interface.